June 13, 2014 marks the last time we will see a Friday the 13th land on a full moon until 2049. So, obviously, we must celebrate this momentous occasion by watching one, two, five or all of the Friday The 13th movies. 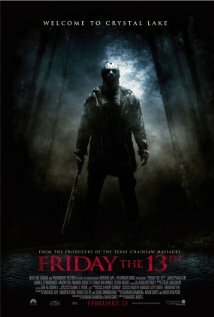 Since I have deemed myself the defender of remakes, I chose to watch Friday The 13th (2009). Though this was a much maligned remake, especially since it came via Michael Bay, people seem to, conveniently, overlook the fact that Shawn S. Cunningham is a producer on the film. That's right, the man responsible for the original Friday the 13th film and it's upcoming television series had a hand in this remake. Directed by Marcus Nispel, who also directed the reboot of the Texas Chainsaw Massacre, this Friday the 13th follows the basic structure of all of the previous films and even nods to quite a few of them. Rather than just retreading the first film, this one mixes in a little bit of story from the first, second and a few others. Starring Jared Padalecki of Supernatural fame, his character, Clay, is searching for his sister Jenna; she has been missing for a month and was last seen in the Crystal Lake area. Clay is constantly met with locals who do not appreciate him nosing around the area. While speaking with a gas station attendant, Clay runs into a group of twenty somethings who are heading to Crystal Lake to stay in an ostentatious vacation home. The alpha male of the group is a super jerk and you cannot wait for him to run into Jason. I really enjoy Jason 2009; he is big, tall, strong and a fast runner! He is proper scary. Bonus, he wears a burlap bag over his head at the beginning of the film. I can only speak for myself when I say that "baghead" Jason is my favorite Jason and it was nice to see him have a little comeback. Ultimately, he does find his beloved hockey mask, though. Like all of the sequels before it, this Friday the 13th is chock full of gruesome deaths and naked boobies. We have it all here folks, the stoner, the comedian, the jock, the good girl, the slutty girl; every character is a walking, talking horror stereotype. What I found really clever is the fact that the final girl isn't who you think it is. And you really couldn't do much better than Padalecki as your lead. After all of his years on Supernatural, the guy knows how to do horror and he certainly isn't terrible to look at for 90 minutes. So, here's the deal, if you saw this film as your first foray into the series, you would, probably, find it to be a solid entry in the slasher genre. While it isn't forging any new territory, it is fun and clever enough to leave you open to a sequel. If you can put aside your feelings for the original film, I think that you will find this to be exactly what it claims to be; a story about a guy named Jason Voorhees who slaughters oversexed twenty-somethings in really gross and creative ways. Sure, he has some mommy issues, but who doesn't?